Here at your Plano Dentist office we understand the importance of fluoride and encourage our patients to brush with a toothpaste that contains this vital substance. Substantial research has shown that fluoride has a very positive impact on teeth, and when used in the right amounts, like brushing your teeth with a fluoride toothpaste, it can help teeth repair and significantly reduce the chance of a patient getting a gum disease or cavities. Brushing, naturally, is one of the key ways that fluoride can get to the teeth and so we recommend a fluoride toothpaste and a healthy routine of tooth brushing every day. Believe it or not there are still people who question the importance of brushing one's teeth at least twice per day. We know that when food is left on teeth it reacts with the naturally occurring bacteria. This naturally occurring bacteria then secretes an acid, which when collected on the teeth starts the process of decaying. The longer the acid stays on the teeth, the more the chance of decay. Additionally, almost instantly after eating the mouth produces a natural coat called plaque. This plaque covers up the bacteria and speeds up the process of erosion. The only way to remove these two is to brush one's teeth after a meal. At minimum brushing in the morning and again before, bed are critical to ensure a healthy mouth and good oral hygiene. 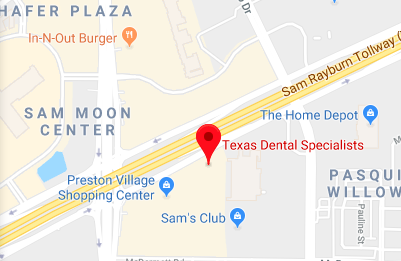 When you visit our Plano Dentist office, we will always recommend that you brush your teeth a minimum of twice per day and also have a routine of flossing to remove food and plaque from between your teeth. A healthy routine of brushing, rinsing, using mouth wash, and flossing is a great way to keep your mouth in the best health possible. Additionally the use of fluoride toothpastes has the added benefit of introducing the right doses of fluoride to the teeth, which in turn also help prevent decay and disease. Apart from fluoride, toothpaste provides a number of other benefits and, so it is recommended that you brush your teeth, at least twice daily, with a fluoride toothpaste. Toothpaste, when used in conjunction with the correct brushing motion and a well maintained toothbrush helps to remove dangerous plaque and keep the teeth safe and without cavities. The fluoride in the toothpaste also helps to promote re-mineralization which minimizes and helps repair early decay before it even becomes obvious. Additionally toothpaste gives the user fresh and clean breath, which leaves the mouth feeling refreshed and feeling extremely clean. Many toothpastes also contain a whitening agent which help to whiten the teeth every time a user brushes their teeth. As the user brushes their teeth the whitening agent works to promote white teeth and a brighter smile. As important as brushing your teeth, with the right toothpaste, is it is also important to take other steps to maintain good oral health. This includes a healthy diet, flossing regularly, and visiting the Plano Dentist office for regular checkups.